Just steps from Piazzale Michelangelo, this Neo-Renaissance villa surrounded by a classical Italian garden is simply breathtaking. 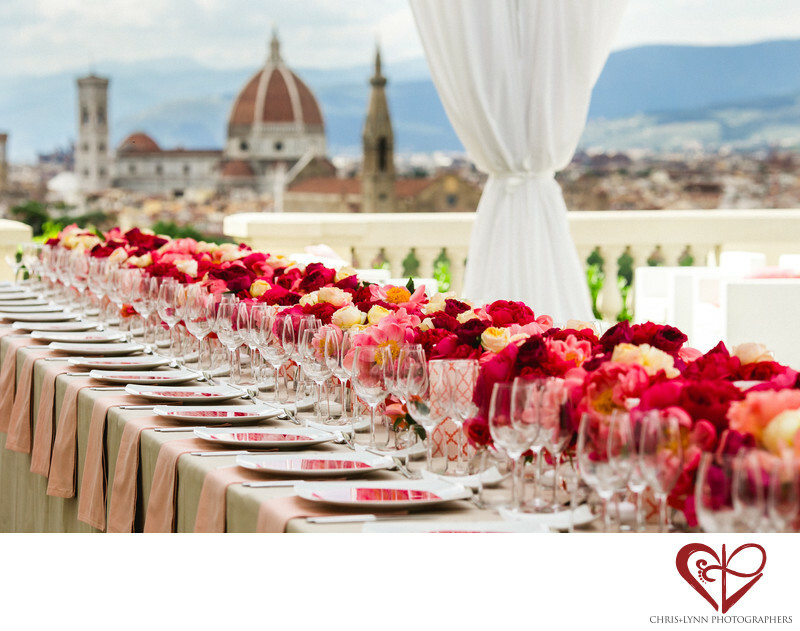 When we first went up to the terrace we gasped at the panoramic views of Florence - what a place to celebrate your wedding! The bride fell in love with this setting the first time she saw it! She and her planner collaborated with their designer and florist to come up with a tablescape that would complement the views, encourage intimacy, and match her strawberry and gold color scheme. The result? A long table with low vibrant floral arrangements of peonies and roses - I loved the extra detail of glass-cut menus with each guest's name on them. Though the bride and groom may plan each and every detail of their reception decor for many many hours, the whirlwind of the wedding day means they often don't fully take in the final result - It was all a blur! - we often hear! As wedding photographers we often think of ourselves as the couples' other set of eyes - making sure we see for them all the things that go by so fast. Capturing all beauty of the decor and details that were thought out so carefully is something we love to do. Location: Viale Michelangiolo, 78, 50125 Firenze, Italy Villa La Vedetta,. 1/1000; f/5.6; ISO 400; 135.0 mm.